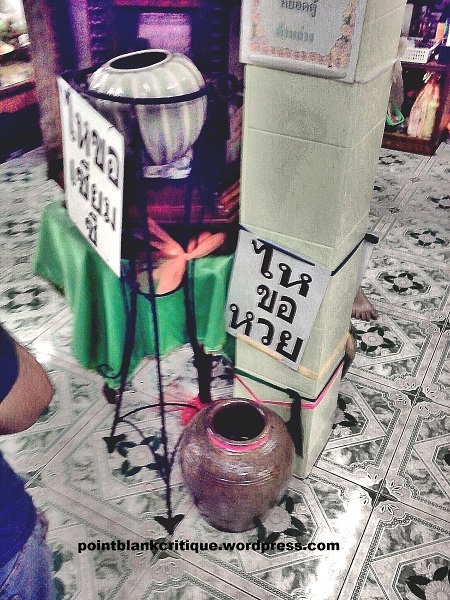 Thai Superstition. 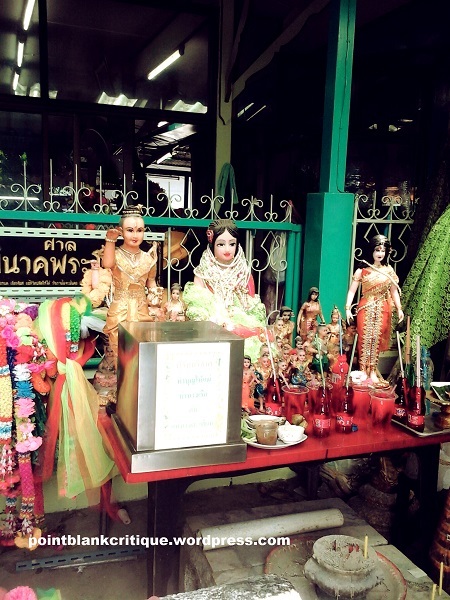 The Thai peoples are rather superstitious peoples and their spiritual as well as beliefs in the supernatural has been passed down from generation to generation. However, one story stands out among all others and has become a ghostly legend spanning almost two centuries during the time of King Mongkut. Even if you do not believe in ghosts, this tale will send a tinge of empathy and shivers down your spine. Mae Nak, a beautiful woman in the 19th century with many suitors vying for her hand, chose a man called Pi Mak as her husband, who was conscripted into the war to defend Thailand in those days. According to actual records, the couple lived along the Phra Khanong canal in Bangkok and their house was situated near the canal. The actual house is now gone but if you visit the site, you will have a good idea of what it must have been like in those days for life among those who dwell in such places. Mae Nak was left alone and pregnant when her husband, Mak, was sent off to the war where he was subsequently injured and took a long time to recover before returning to his village. During the course of his recovery, Mae Nak who was expecting went into delivery with complications and as a result she died along with the child during child birth. It is not known if the child was a boy or a girl as later versions of the story differed. The story of Mae Nak is based on the actual events that followed and recorded into the legends and folktales of Thailand. Mae Nak so loved her husband, Mak, that even in death she was not willing to leave the natural world and returned as a ghostly version of herself with her child. When Mak returned to the village after recovering from his wounds, he had no idea of what had happened while he was away as in those days there were no such things as hand phones or even snail mail. He returned to a home he thought was normal with his loving wife and child waiting for him along the canal bank leading up to his home. The couple lived happily just as any normal couple would with a significant difference. To Mak’s neighbours and friends, he seemed to be living in a world of his own and everyone attributed that to his injuries during the war and for a time, no one suspected that he was living with a ghostly entity. Eventually the curiosity of the villagers were founded when it was revealed that Mak was not actually talking or living by himself (as people around him did not tell him that Mae Nak had actually passed away for fear he would relapse and succumb to his war wounds). Those who tried to warn him were dealt with by Mae Nak who held on ferociously to her husband. The house the couple was living in was a derelict and who knows what Mak has been consuming with the thought that Mae Nak was looking after him! Eventually Mae Nak became a possessive and vengeful female ghost in the effort to keep them together as a family unit. 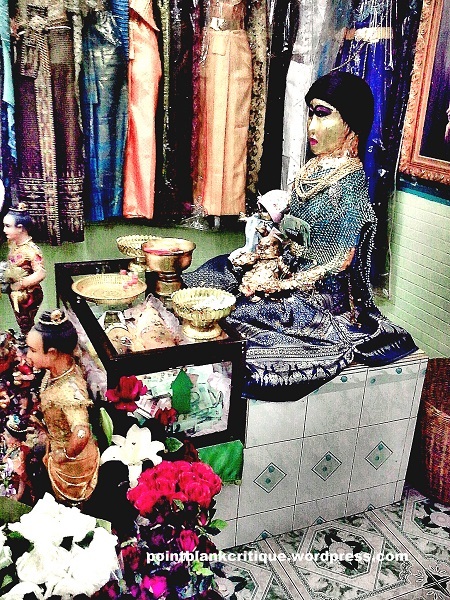 The legend of Mae Nak has left much of the area in which she used to live as a shrine to her and is known as the Shrine of Lady Nak in Phra Khanong. Her husband, Mak, refused to believe the people who tried to warn him and as the legend unfolds, he discovered it for himself one day while Mae Nak was preparing him a meal that required limes. One of the limes fell to the floor and Mae Nak forgot to bend and reach for it but extended her hands to reach a fair way down to retrieve it which was seen by Mak and so opening his eyes to the fact that his wife was a ghost. When Mak realizes this, he runs away from his wife and in her anger she starts terrorizing all the villagers. As the spirit of Mae Nak was restless and vengeful towards those who tried to oppose her, a powerful monk was asked to come and exorcise her ghost which was terrorizing the villages and several monks had failed in trying to get rid of her. 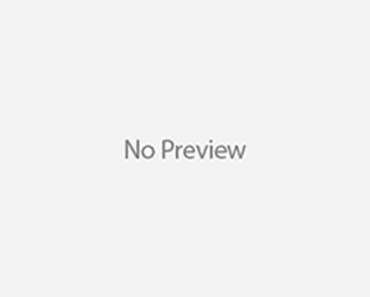 There are a number of versions as to how Mae Nak was eventually captured and the version that stands out is the eventual exorcism by the Most Venerated Monk, Somdet Phra Phutthachan. It was believed that he obtained a piece of skull bone from the exhumed remains of Mae Nak and confined her spirit to that piece of bone which he kept on his waistband until his death when the relic was given to a member of the Royal Family. The legend of Mae Nak is synonymous with the passion for undying love between a couple and thus the belief of those who visit the shrine. 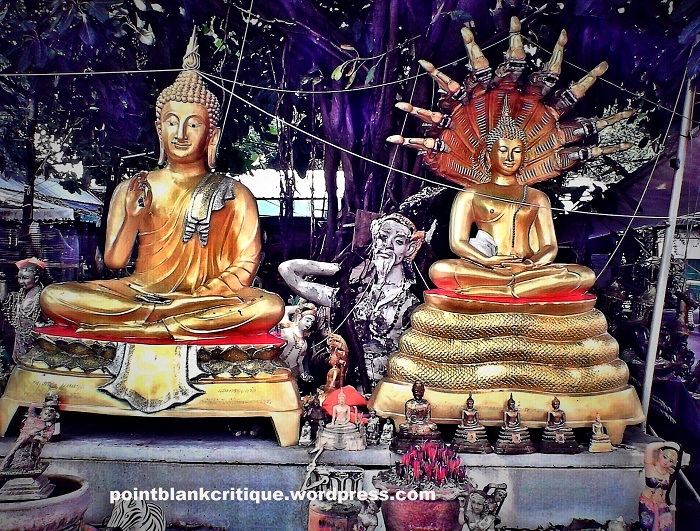 Located in a small derelict corner of a massive temple ( theWat Mahabut) in Soi 7, just a little off Sukhumvit Soi 77 down from the OnNut BTS station. You will have to walk to the back of the temple to get to the shrine and most of the signs are in Thai. It is a small low run down building that is somewhat given the impression that the shrine is wrapped around several big trees. If you come over a weekend, it is normally very crowded and the shrine will be full of people. Most of the people who visit this shrine have two purposes, one is for love devotions and the other is a request for luck. Outside of the Mae Nak Shrine at the entrance is a small shrine where there are sketches of what Mae Nak is believed to have looked like but no one knows for sure as there were no cameras in those days but the overall impression is that she must have been a very beautiful lady. It is only polite to remove your shoes before entering the shrine proper and as you go in, on the left are several counters where you can buy offerings to be presented to Mae Nak or her child. 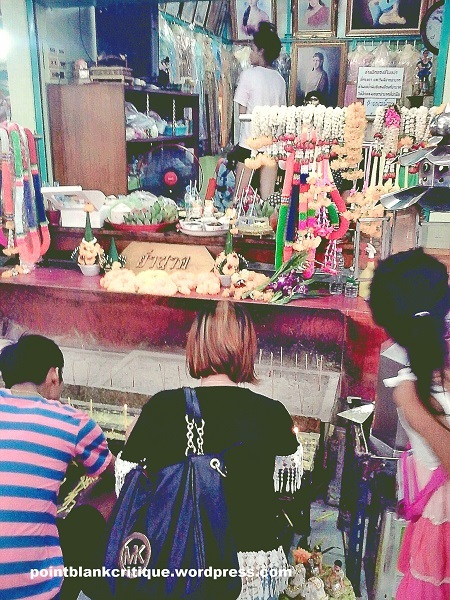 You will notice a lot of people buying things such as toys and clothing for Mae Nak and offering it at the alter in the shrine for her. 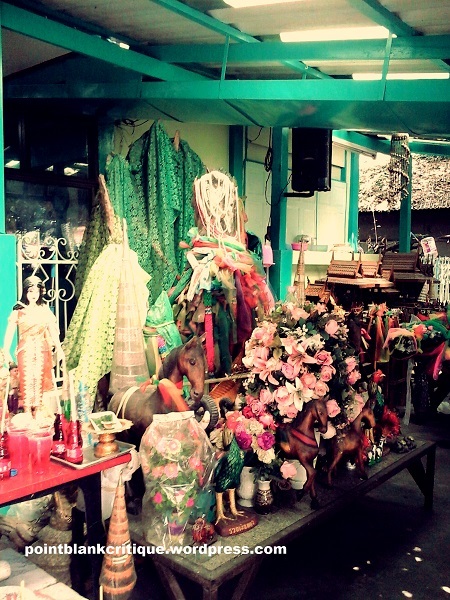 Some of these people give these offerings as a token maybe for request granted or as an offering for asking a favour. 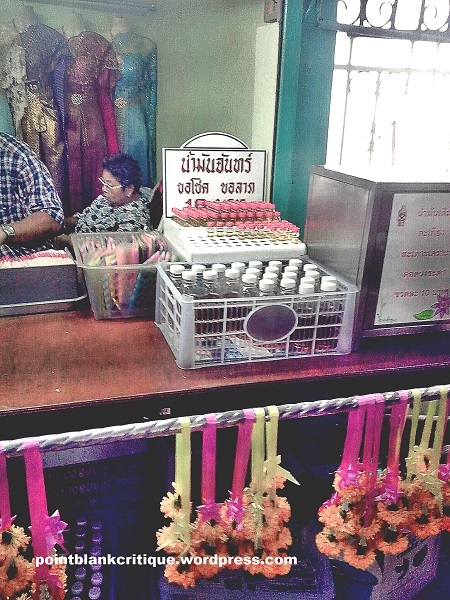 The second counter on the left is where you give a donation and collect 3 joss sticks, a yellow candle, a piece of gold leaf paper and a bunch of flowers. You put your donation into a box in return for those items. 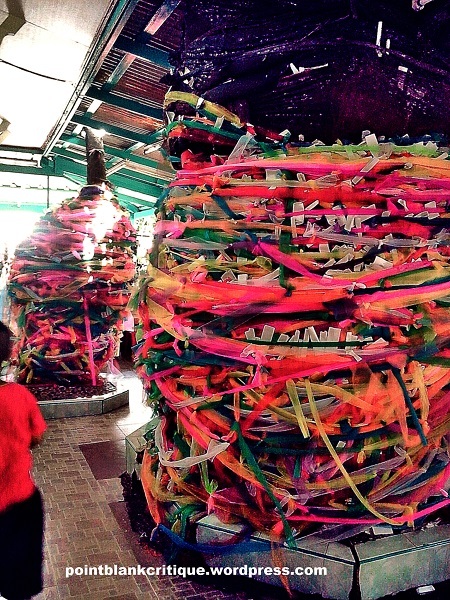 The alter is on the right where these items are placed and in front of the alter are these two huge tree trunks wrapped with layer upon layer of coloured ribbons. Devotees will offer a prayer and give merit to Mae Nak at the alter, after which the candle is placed and the three joss sticks. Walking to the back there is a tray to place the gifts and flowers. 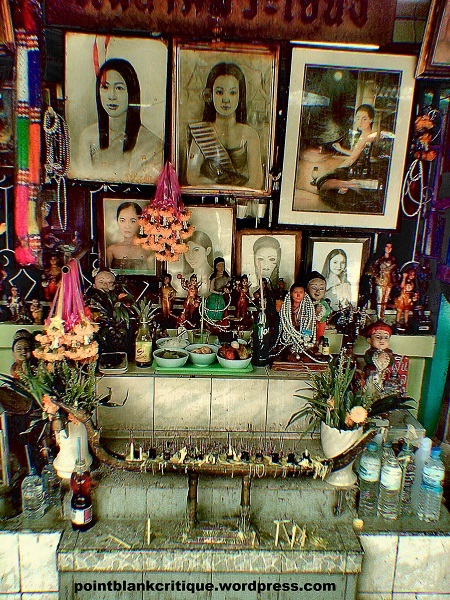 Behind the alter is a room dedicated to Mae Nak. This is supposedly to be her residential room as she would have had when she was alive. 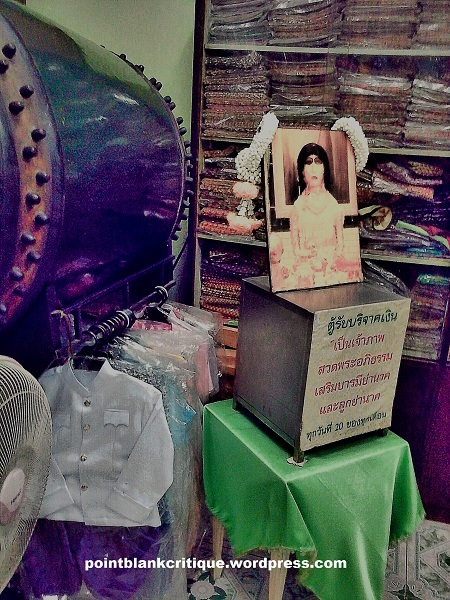 To the left of the room sits an effigy of Mae Nak. In front of her are many small figurines and around her are stacks and rows of clothing given to her by devotees. Elsewhere in the room are several donation boxes and more clothing as well as musical instruments. Against a pillar are two very peculiar jars. In these jars are balls with numbers written on them. In order to take the number in these jars, one makes a donation into the box, make a wish and reach for the numbers in the jars. The top jar contains numbers for fortune telling where the numbers corresponds to a piece of paper obtained from the counter outside after making a donation. Here your fortune is forecasted to you. The lower jar contains singular numbers and you can only pick 2 numbers. These two numbers correspond to the numbers on a lottery ticket! By personal experience, Mae Nak sometimes does grant you the corresponding numbers to win a lottery ticket (my friend who visited actually struck one!). Off course in return you have to do merit for Mae Nak as a repayment of sorts for her granting you your wish. 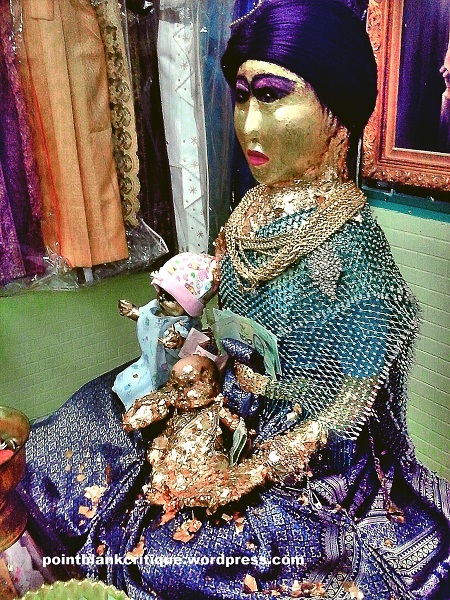 Most prominent in this room is the statue of Mae Nak and her infant. It does look like a very scary representation of Mae Nak but that aside you will notice that she is very finely decked out. Her clothing is changed weekly and the jewellery and chains she wears is real gold donated by well-wishers and devotees. On her hands are layers upon layers of gold leaf paper as she sits lotus position on the small shrine. 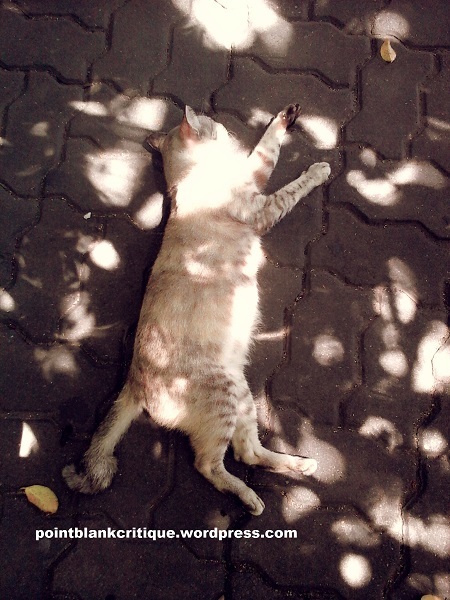 Well-wishers would ask for her favours personally here or to request for help. The amount of items she has been decked with are also symbolic of her granting these favours and help in her own special way. Sometimes you will see many couples coming here to ask for help in their relationships. Women come here to ask for help in their relationships with their spouse or boyfriends, to have a trouble free and easy childbirth and safety for the unborn child or even for their husbands or boyfriends to avoid being conscripted into the military service as Mak, was conscripted so long ago. You will notice a few ribboned trees inside the shrine and if you look closely, bound with the ribbons are small pieces of paper attached in between. These pieces of paper are the fortune papers that were obtained when people took the numbers from the top jar in the room at the back of the alter. Written in these papers are the fortunes and the reason they are put on the tree is because the fortunes are not very good! Therefore they are placed on the trees in the hope of reversing the bad fortune. 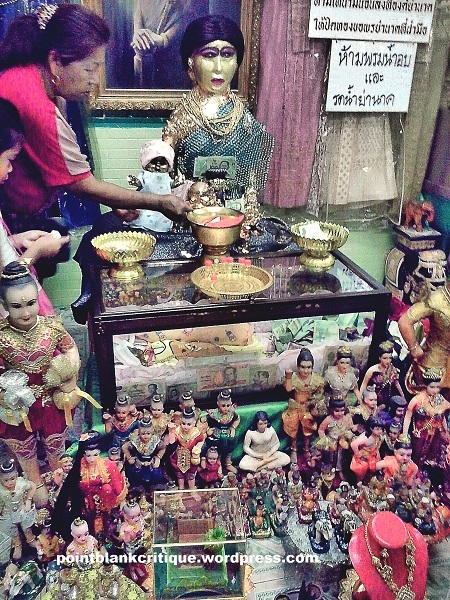 On the right side of the shrine building are more smaller alters where one can make smaller offerings. These alters all serve the main purpose as sometimes it can be too crowded to be on the inside. 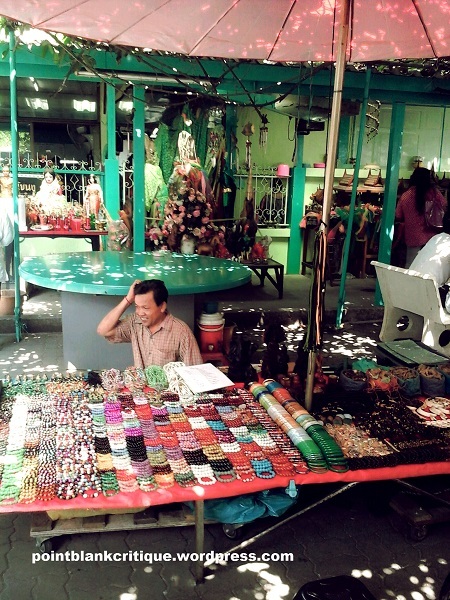 Outside the shrine are many stalls and vendors. 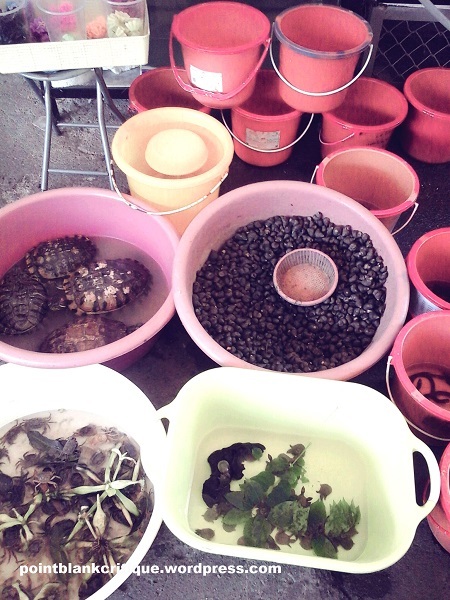 Some of these vendors sell live fish and other creatures. On each stall is a sign that tells you the number of live aquatic creatures you have to buy for the day that you are born and what each creature signifies. 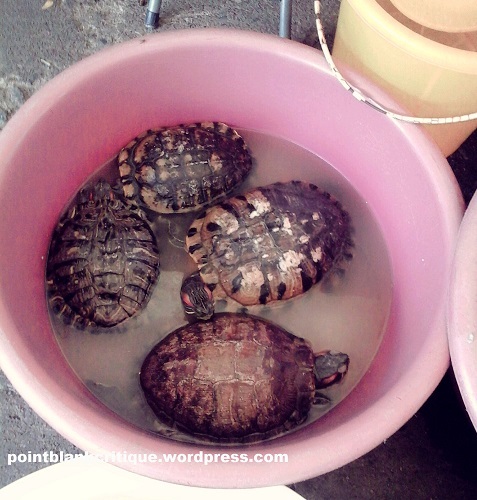 For instance, eels are for good fortune, fish are to release bad luck and crabs are to get people to help you while tortoises are for longevity. You buy the desired number of creatures and make your way to the canal which is a short walk away . 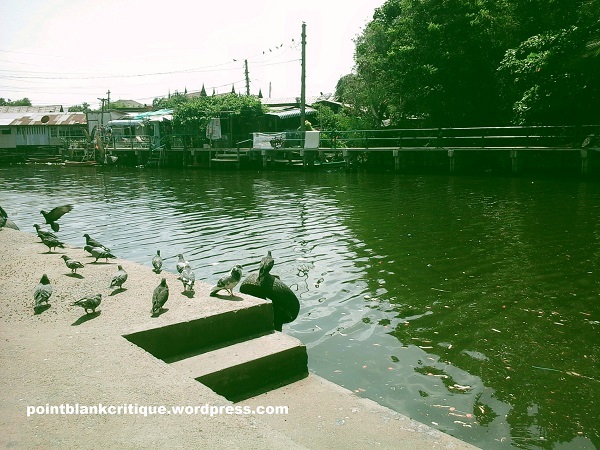 Along the canal or khlong as they are called is where you can release these creatures after reading from a script of Buddhist verses. 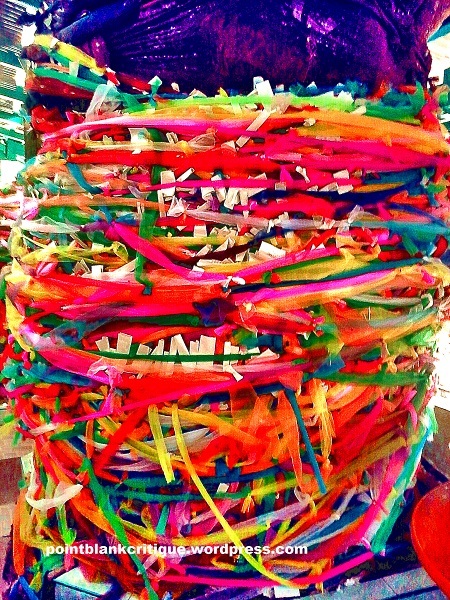 It is believed that doing such an act brings good merit and karma. 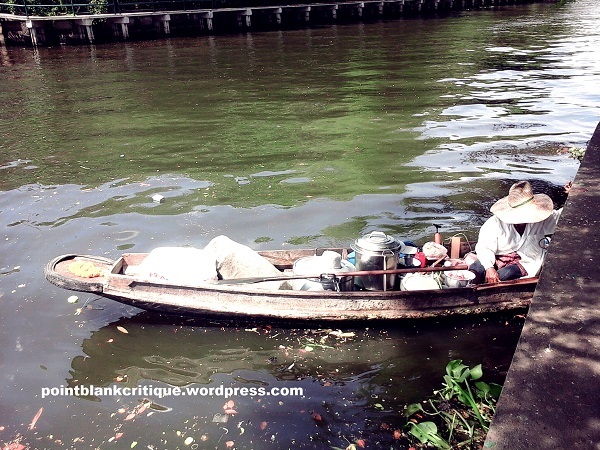 The klong is also where some of the long tail boats and smaller paddle boats come to ply their trade from the nearby villages. 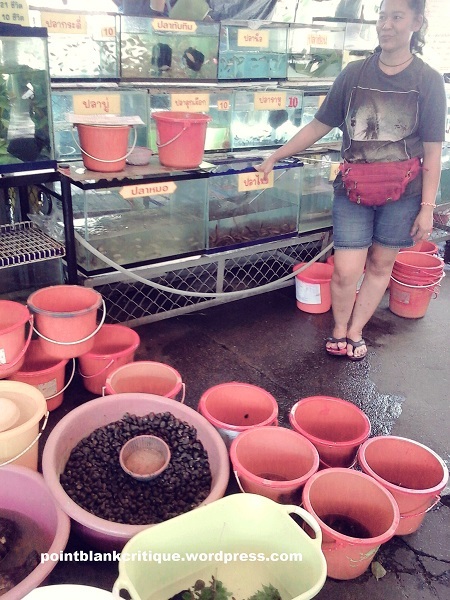 Some of these vendors sell hot food such as noodles or desserts much like a small floating market. 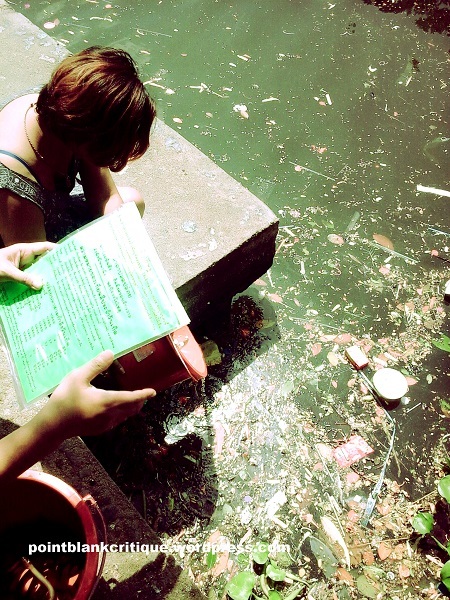 You can also buy fish or bird food to feed the many pigeons and fish in the canal. 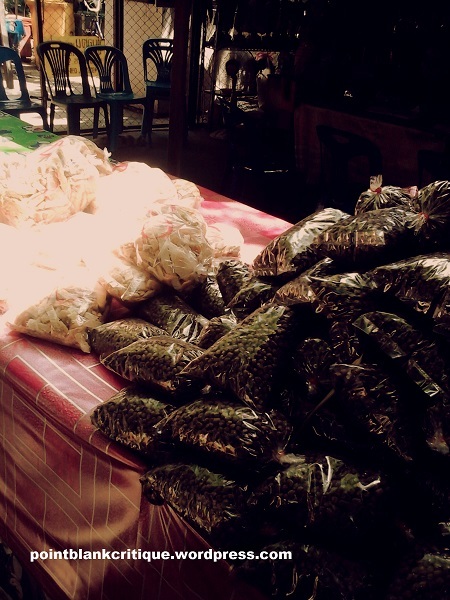 Each of these bags of food retail for around THB10 a bag and is again considered a form of merit and good karma. 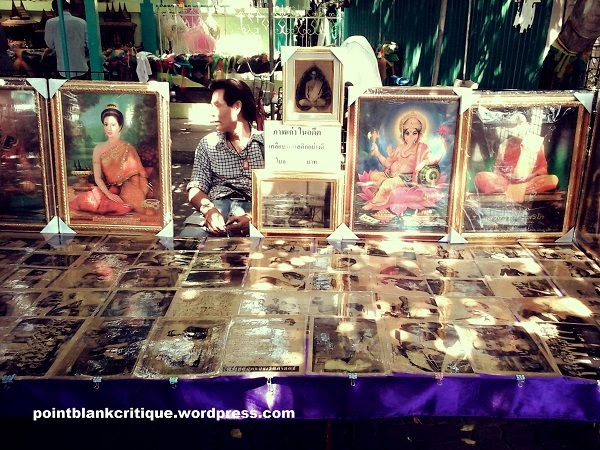 All around the temple grounds are other vendors selling food, clothing, amulets and holy pictures. There is no shortage of food and drinks here especially on a weekend. 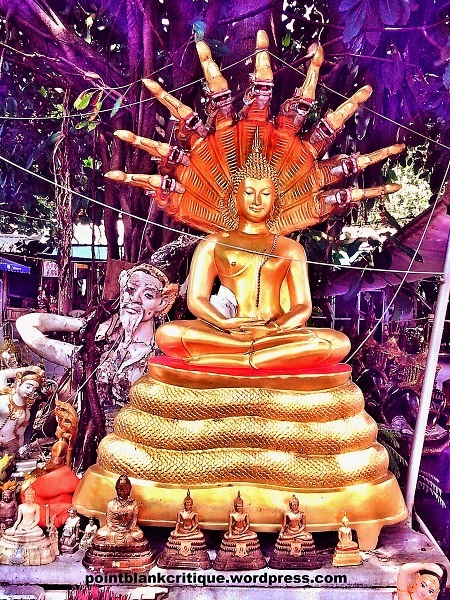 As you exit the temple grounds there is a shrine with two gold statues and one that looks like a demon in the back situated under a large shady tree. 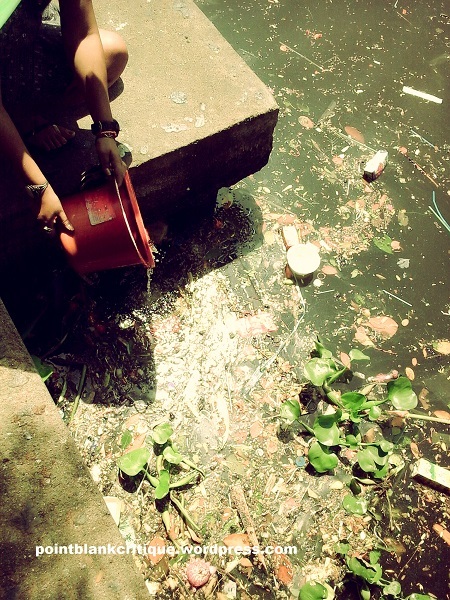 Devotees sometimes make offerings of joss sticks, candles and small flower garlands here. 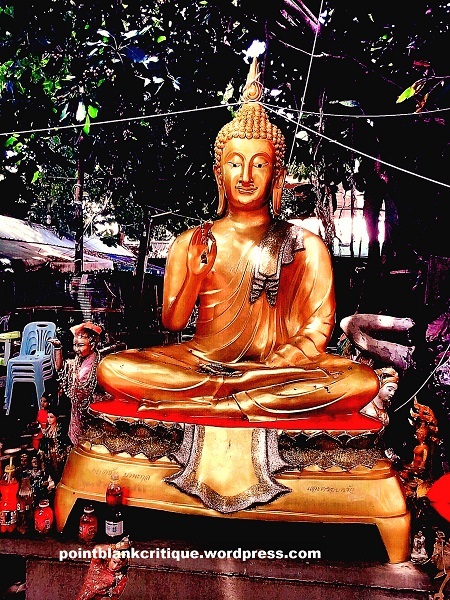 When you are looking for something of the supernatural, a legend of Thailand and short of a ghost in physical form, the Shrine of Mae Nak in Phra Khanong is an interesting place to visit. Mae Nak’s star struck forlorn love for her husband, Mak is an example of a wifely devotion that transcends even death just to be with the person she loves and thus an example of undying love between a couple as well as the basis of several ghost stories in Thailand and some box office Thai movies!